What’s on the menu today? 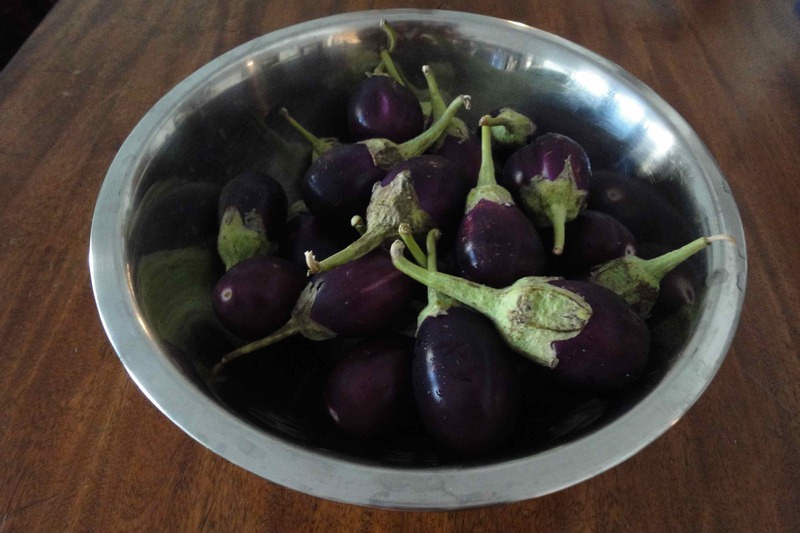 Baghare baingan, meaning tempered eggplants, from Hyderabad. Agastya fondly calls this dish “eggplants in peanut sauce” but to be fair it also has an equal quantity of coconut and sesame seeds in it. 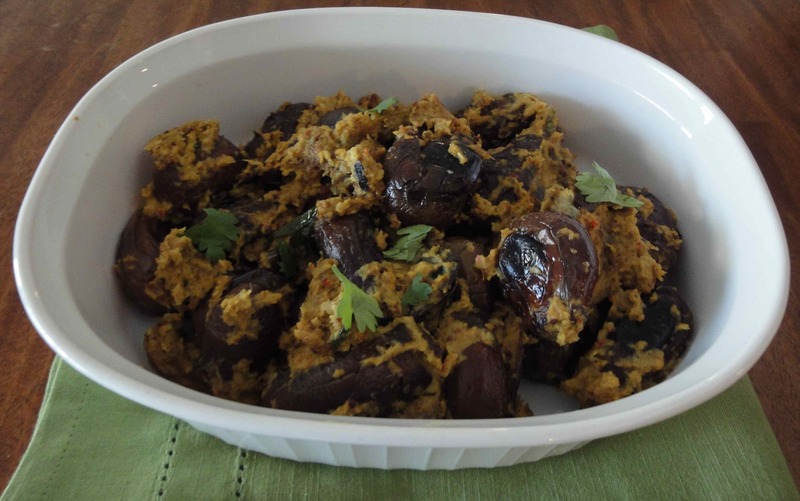 My husband’s cousin, Kasturi, made this richly flavored eggplant dish for me at our first meeting, about six years ago. I’ve never stopped thinking about it. Although I’ve made it a few times since, this time I want to make it again under my mother-in-law’s watchful gaze. “Come here and see if I’m doing everything correctly,” I call to her. “I’m coming to watch and learn,” she smiles. That kind lady always makes me feel better about my cooking abilities. 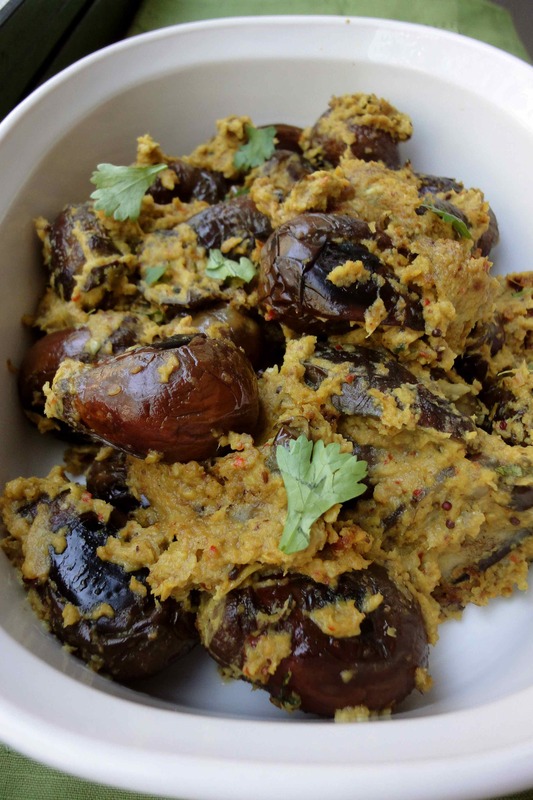 This dish is best made with small round baby Indian eggplants, but any eggplant sliced up can be used. First, pan grill the eggplant. Simultaneously roast the nuts and spices and fry the onions, all of which are ground up into a paste. For the final step heat oil in a pan and put in the tarka, and fry the ginger and garlic. Next add in the grilled eggplant and the nut and spice paste. The steps sound fussy, but having done this dish in pot entirely and then this way, I have to say that the separate roasting and frying and grinding is all completely worth it. It makes the dish taste incredibly complex with layers and layers of flavor. Note the recipe below makes enough to serve 6, so halve it to serve 2-4. 1. Wash and trim the eggplant, and slit crosswise from the top, stopping towards the bottom. Alternatively slit the baby eggplant lengthwise into two halves for faster cooking. Place the eggplant in a large bowl of salted water as you cut them. This draws the bitterness out of the eggplant. Put aside for 10-15 minutes. 2. Heat half the oil in a large pan. Put whole eggplants or the halves face down in a single layer. Cook on medium heat, turning the whole eggplants once every few minutes until the eggplant cooks through and a knife poked in the middle goes through easily. Be careful to not overcook the eggplant else it will fall apart in the sauce. Keep the eggplant aside and keep the pan for step 4. 3. 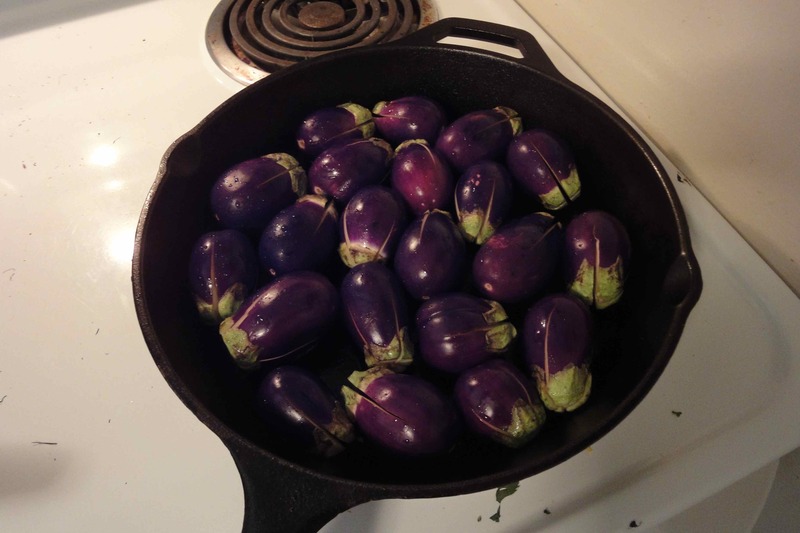 While the eggplant is roasting, heat up a small pan. First dry roast the sesame seeds and put into a dry grinder. Next, roast the peanuts in the same pan, and place into the dry grinder. Now, roast the red chillies in the same pan and add to the grinder. Turn the dry grinder on to powder the sesame, peanuts and red chillies. To this powdered mix add the coconut pieces and grind again. Keep aside. Meanwhile heat a little oil in the same pan and fry the onions until golden brown. Separately grind these onions in a wet grinder. Now combine the sesame, peanut, chilli and coconut paste and the onions with half a cup of water and pulse once in the wet grinder. Add salt to this masala paste. 4. Heat the rest of the oil, and add in all the tempering ingredients in this order: cumin seeds, mustard seeds, green chillies, curry leaves, ginger and garlic paste. Cook for a couple of minutes. Now add the roasted eggplants and the masala paste made in step 3. Add the turmeric powder. Cook for a a few minutes, stirring to make sure that the paste doesn’t stick to the bottom of the pan. Now add some water (about ½ cup), the rest of the dry spices – coriander, garam masala and cayenne pepper powder. Cover and cook for about ten minutes on medium to low heat. Uncover, and add some of the tamarind extract, tasting to see how much is needed. Also adjust salt at this time. Cook for another minute and remove from flame. Garnish with freshly chopped coriander before serving. Best eaten with hot rice.